Diane's Swedish Folkart is a comprehensive study of Swedish Folk Art. It shows the traditional Swedish Folk decoration on beautiful Scandinavian-inspired wooden pieces. Swedish Folkart includes dozens of projects with line patterns, all in acrylics. "Swedish Folkart is a beautiful, informative book that has been truly needed for some time. I will treasure it." "Congratulations to both you and Gudmund (Årseth, Graphic Designer) on your new book. Your best ever, I think, I am very impressed with all your knowledge." "I like this book. As one who is just learning the Swedish Folk painting this is going to be a well-used resource. The book is full of color pictures that are beautifully done. The book has pictures of old pieces and pieces recently done by Diane. I appreciate that she has listed the sources for inspiration for each of the pieces that she has done. I like history and she gives good background information on the early artists, styles, materials used, how to prepare woodenware and procedures. 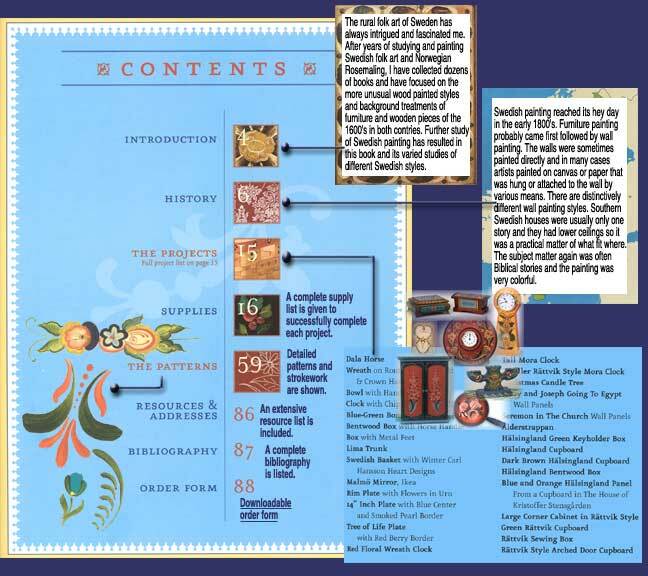 Those with more painting experience will also equally benefit from this book." >> See Diane's painted signs done for the Scandia Butik Gammelgarden Museum in Scandia, MN.